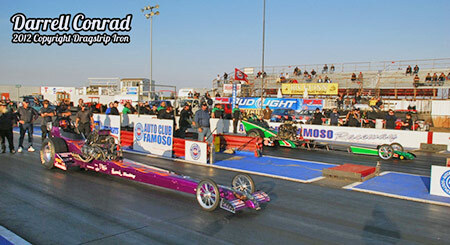 The 54th edition of the fabled March Meet truly offered a mixed bag of weather and racing. 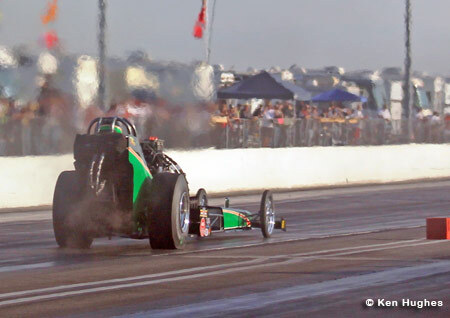 The temps on Thursday (50's) morphed into the mid 80's by Sunday. 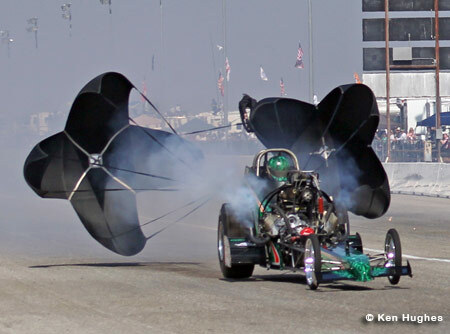 This made for some tough tuning decisions and a couple of nasty crashes. 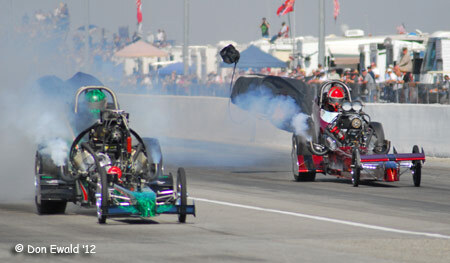 Saturday offered perfect weather with a full day of racing to a record crowd. 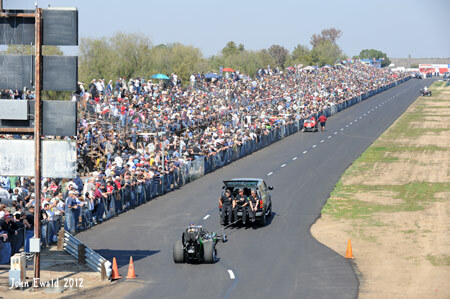 Gas prices be damned, the crowds everyday were the best ever. 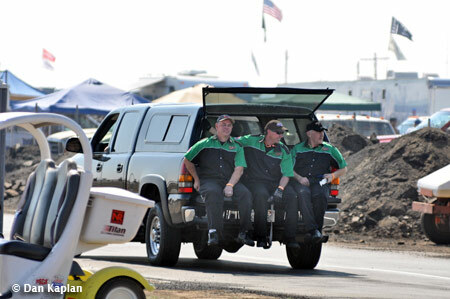 Just what the Bowser's needed. 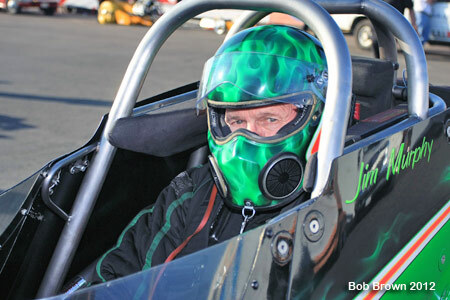 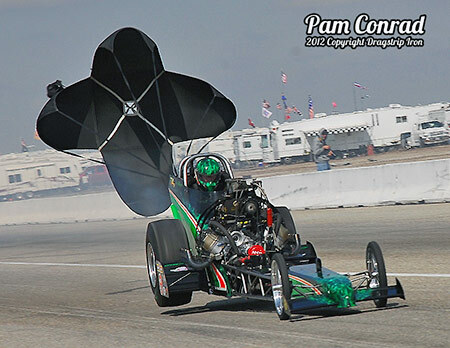 Jim Murphy was back to take another shot at winning his fifth March Meet to tie him with Don Garlits for the all time best. 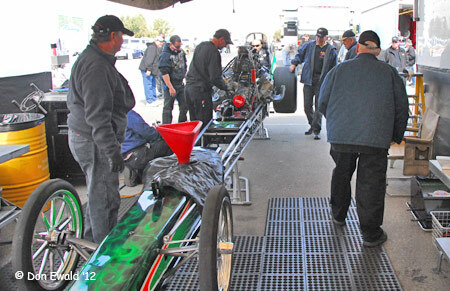 But it turned out for he and his WW2 Racing team the weekend became a mixed bag of good and bad and in this case, the bad won. 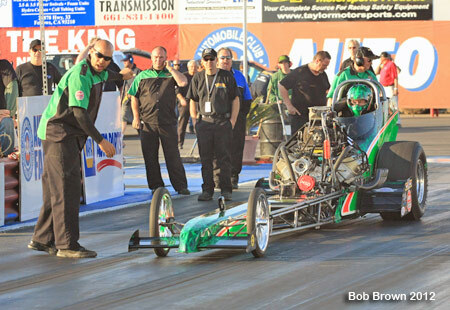 After qualifying #5 with a solid 5.716 the high expectations went south when, in the first round, solidly in the lead Murphy's car "darted" to the left crossing the center line and ending his weekend early. 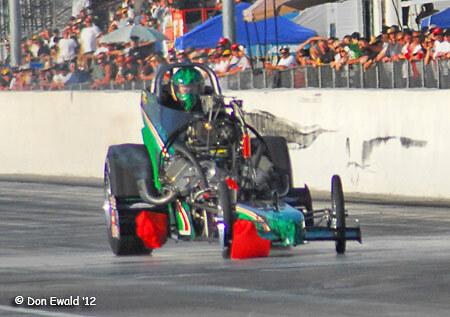 Be that as it may, although disappointing, the team will be the weekend of June 22-24 at Spokane County Raceway in Spokane WA. 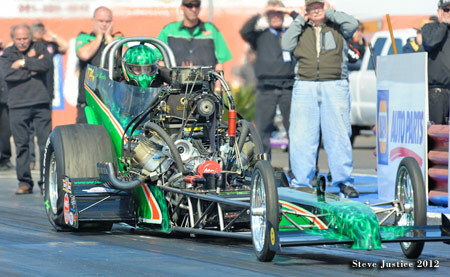 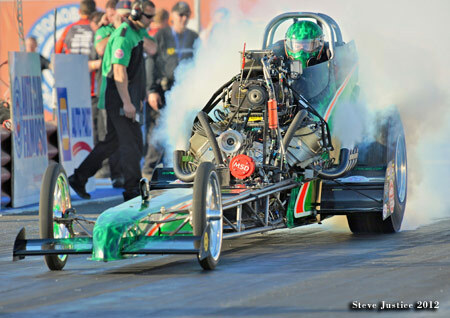 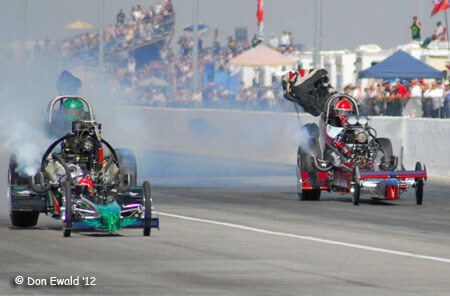 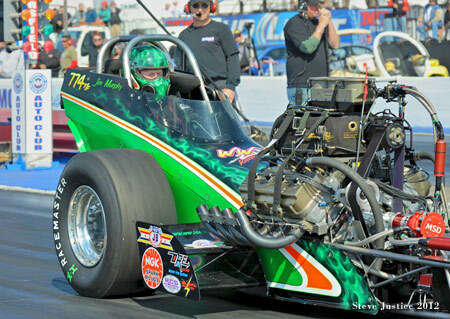 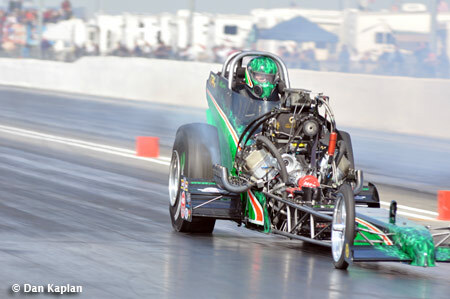 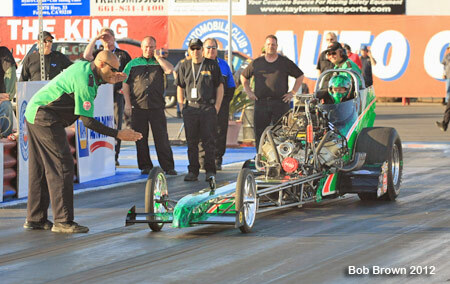 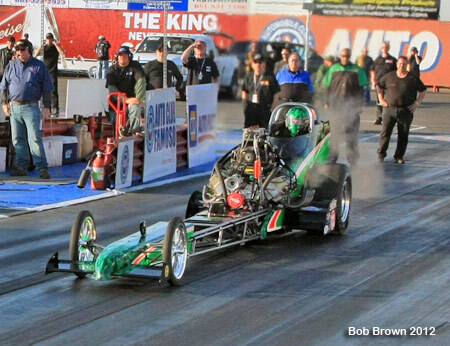 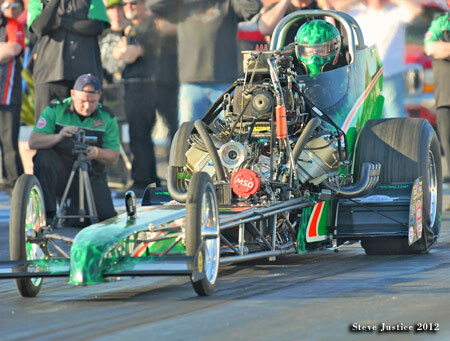 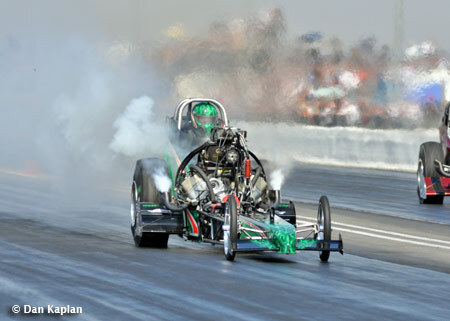 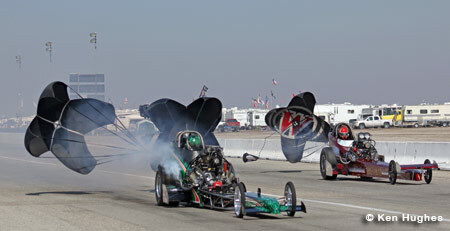 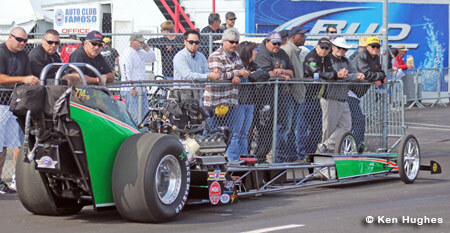 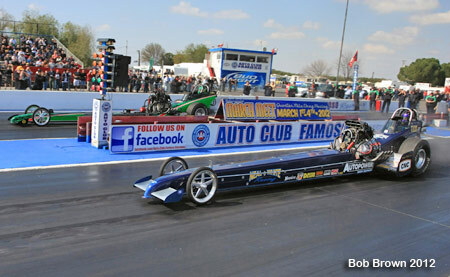 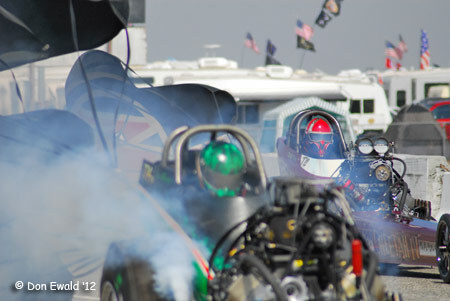 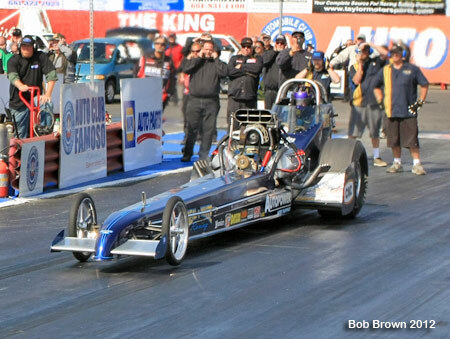 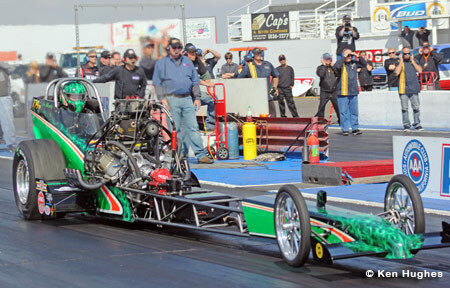 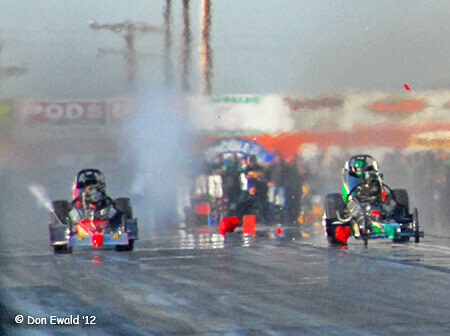 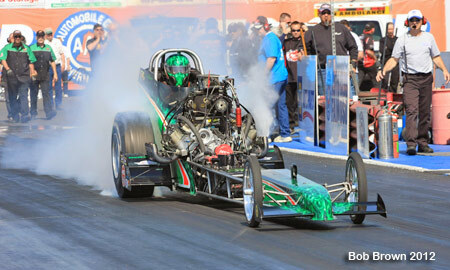 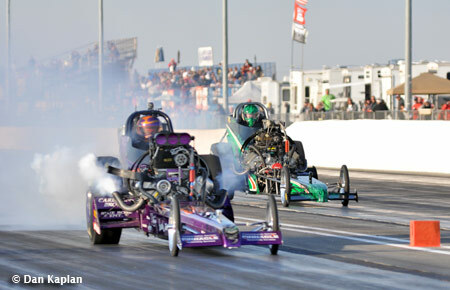 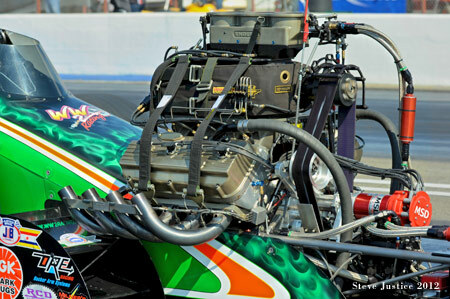 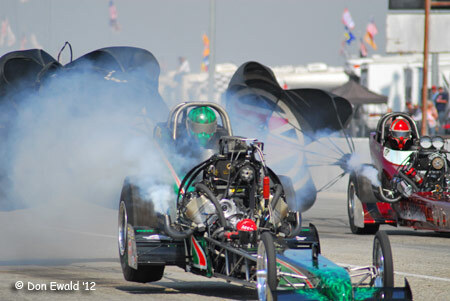 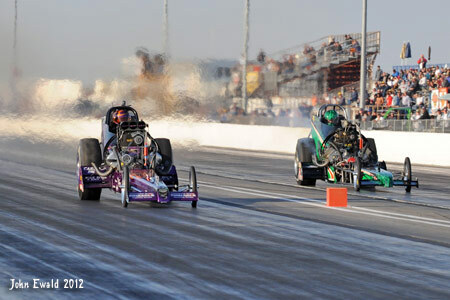 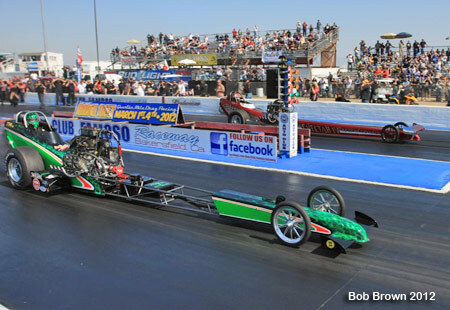 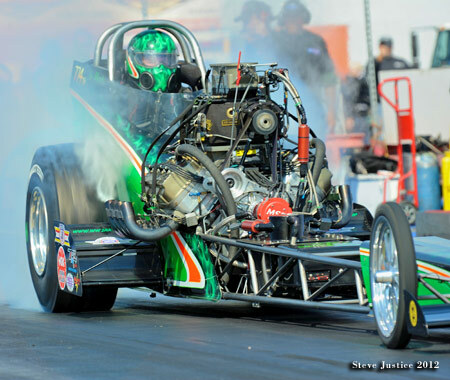 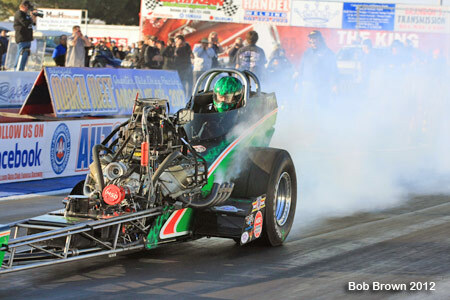 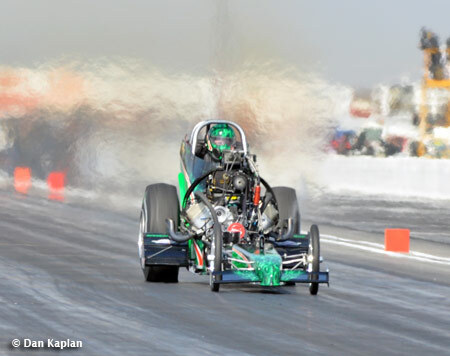 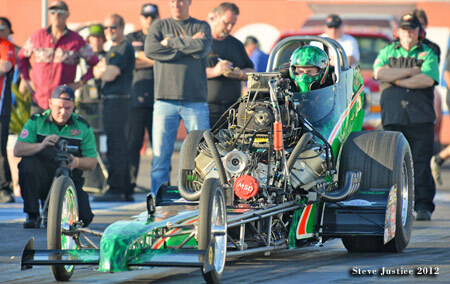 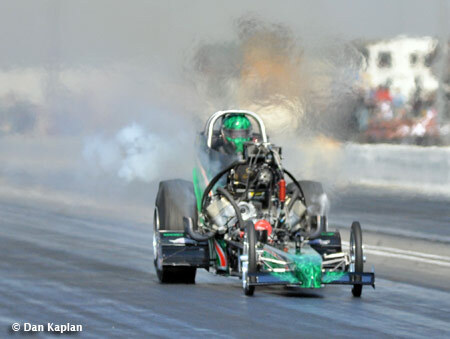 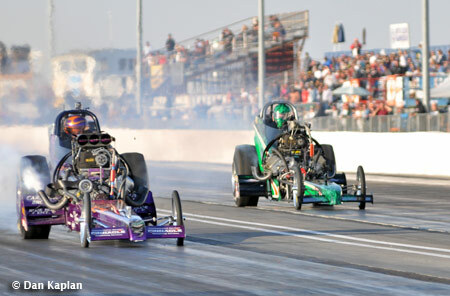 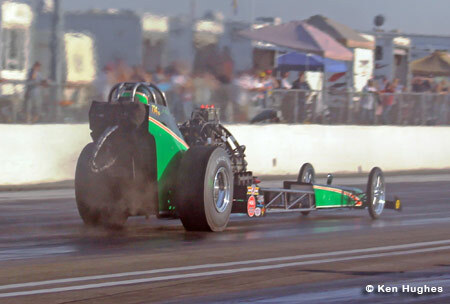 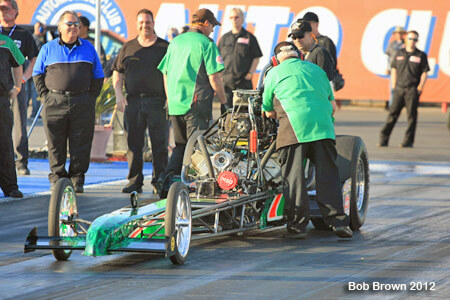 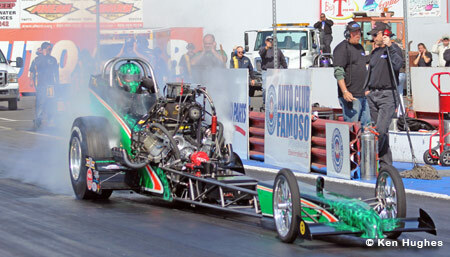 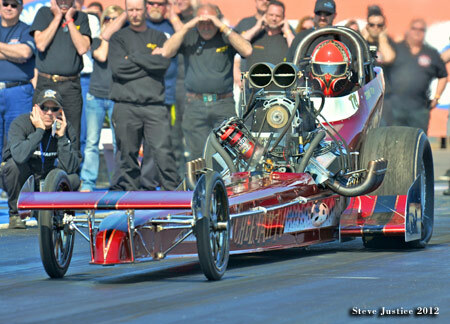 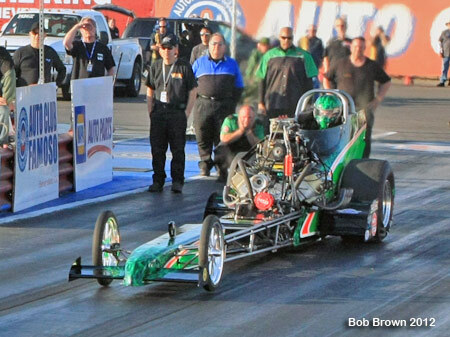 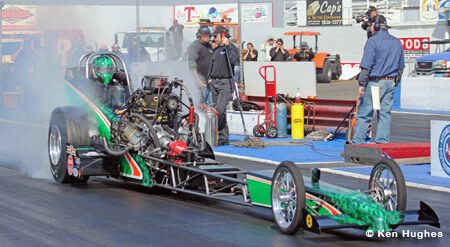 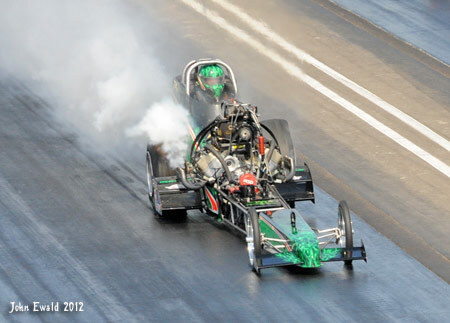 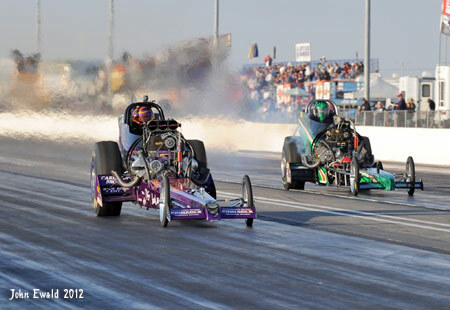 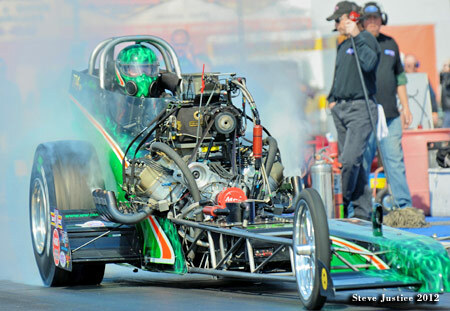 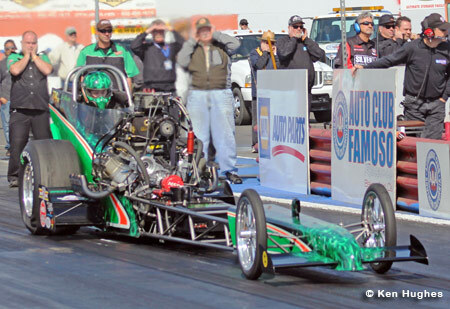 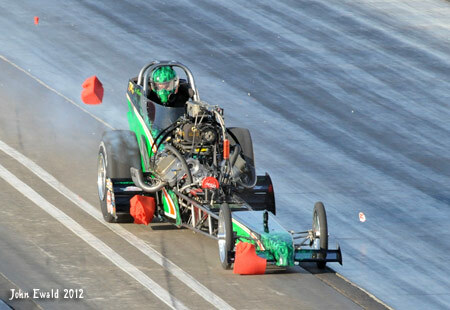 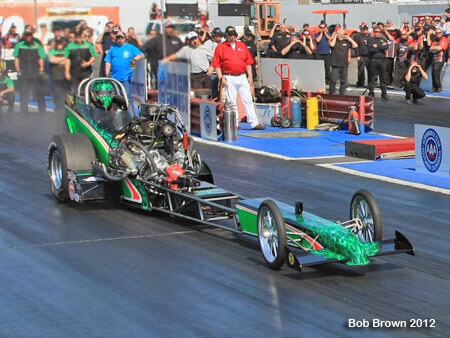 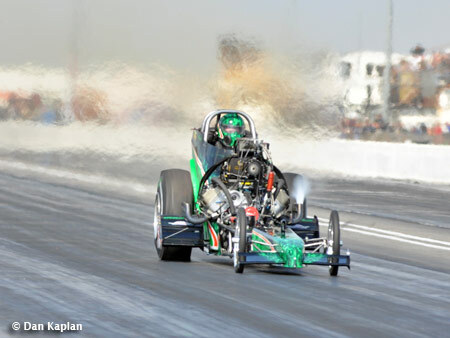 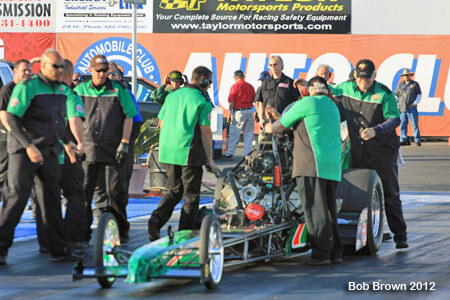 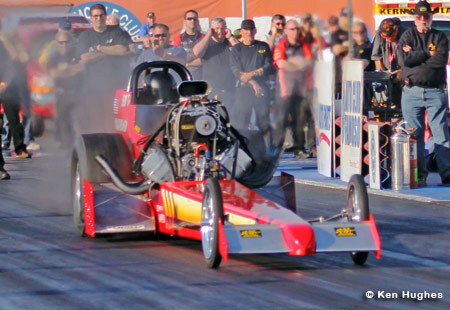 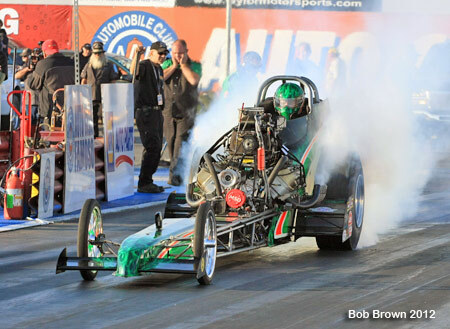 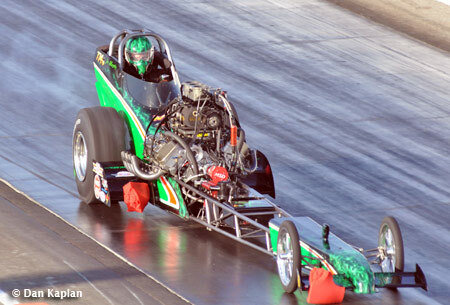 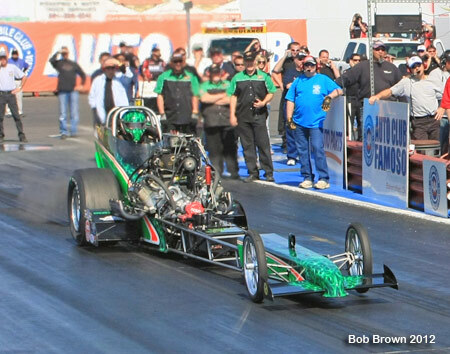 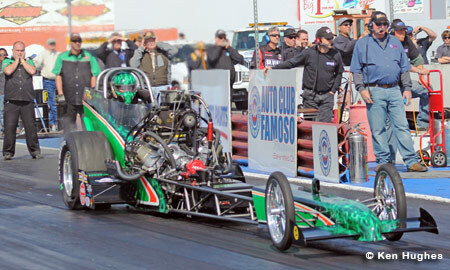 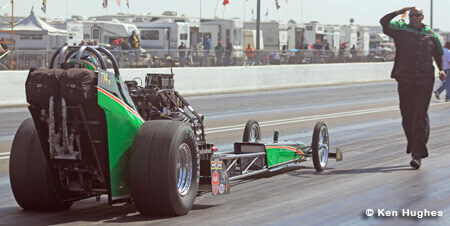 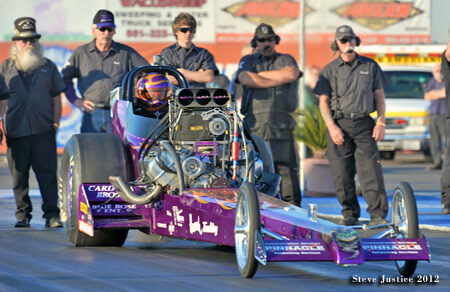 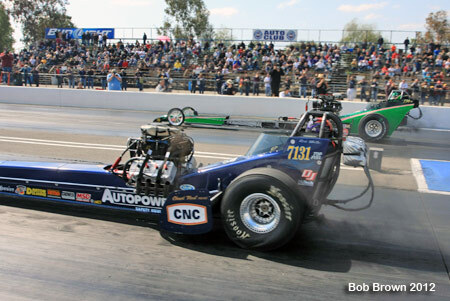 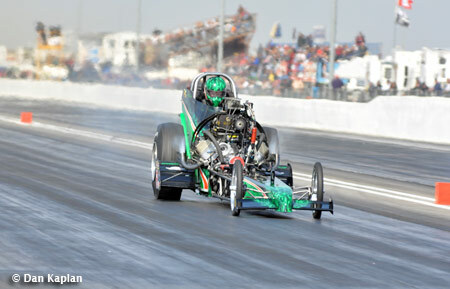 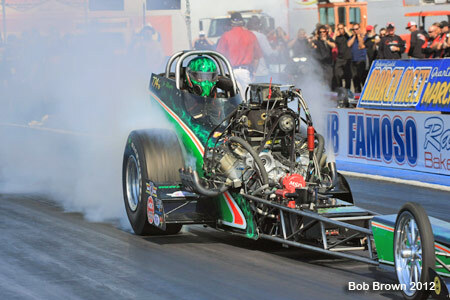 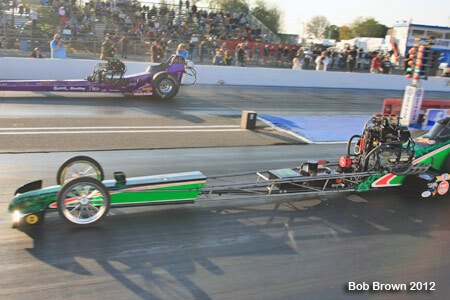 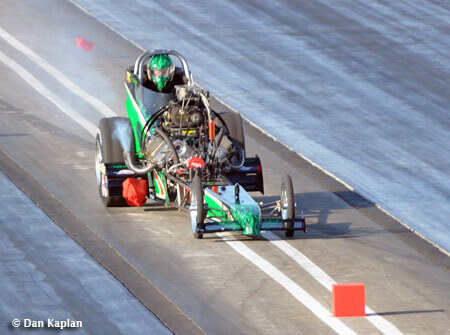 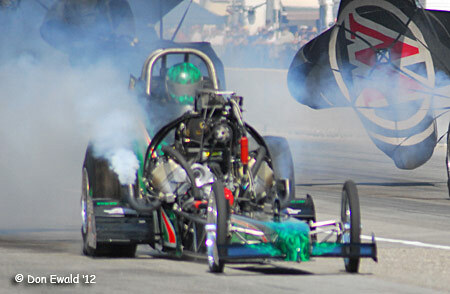 It will be an inaugural NHRA Hot Rod Heritage Series point race featuring a 16 car Top Fuel show. 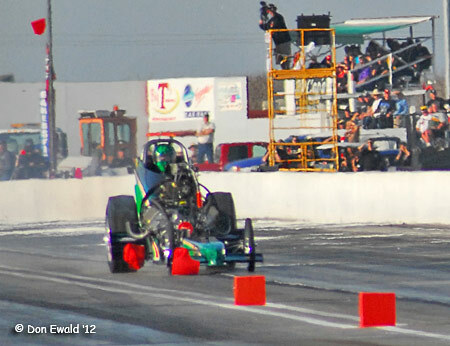 Friday was in a word, cold. 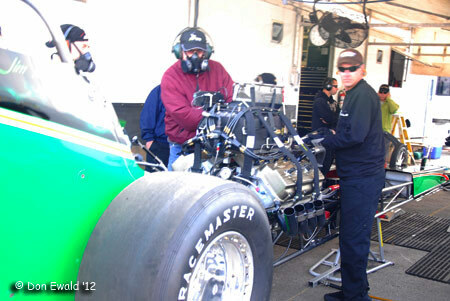 Here the team warmed up the engine prior to the first of two Friday qualifying sessions. 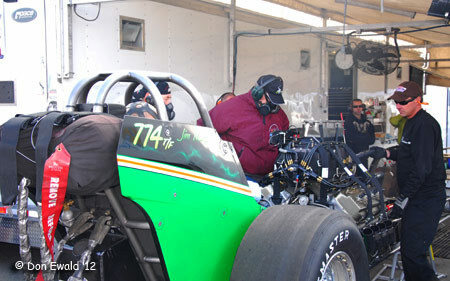 Mike Beebe waits in the seat while Chris Godleski buttons up the engine. 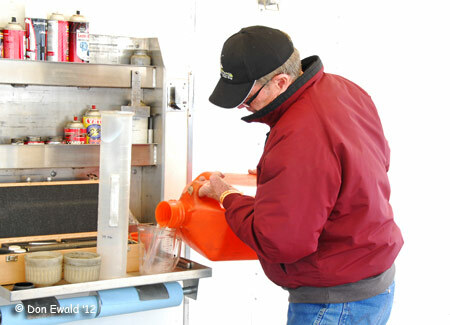 As he always does, Jim mixes the nitro. 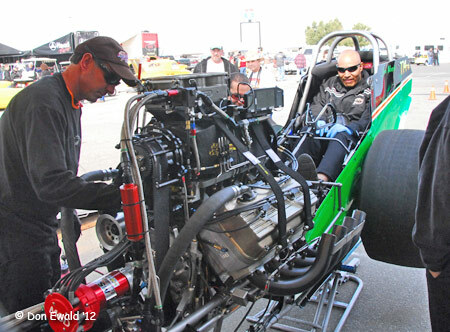 Crew Chief Time Beebe lights the engine. 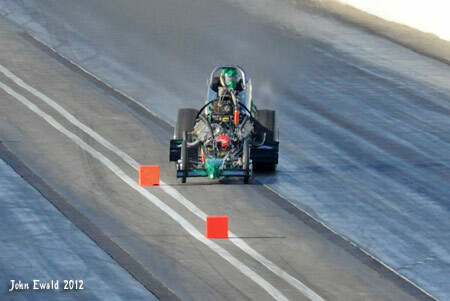 Murphy and Rick White chose to be the first pair out on the untried track (for fuel cars) for the first session. 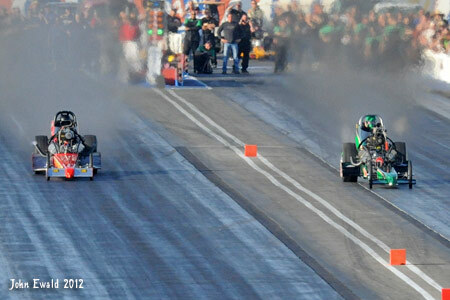 A gutsy call by the two veteran drivers. 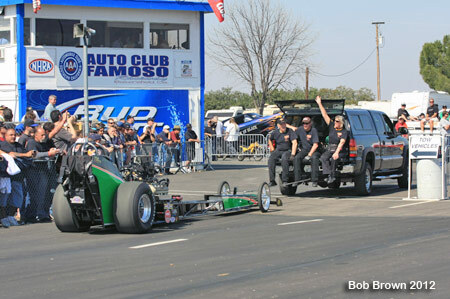 After the burnout Mike Beebe guided Jim back to the line in his groove. 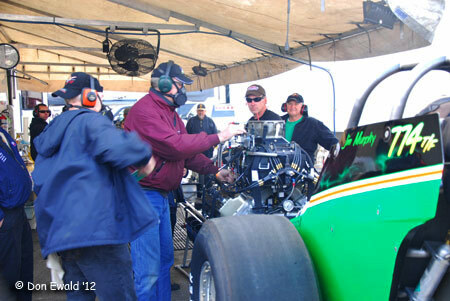 Crew Chief Tim Beebe making the final adjustments before sending Jim to the line. 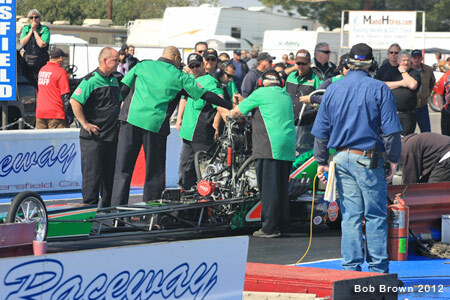 Murphy's solid baseline 5.801 at 238.89 would be good for #3 at the end of the session. 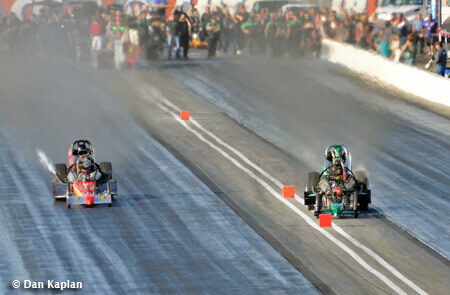 Once again Murphy chose to run first, this time in the opposite lane. 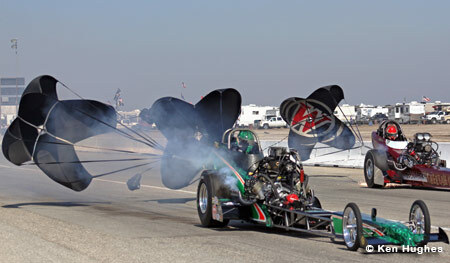 Murphy left good but McGee literally jumped out of the gate. 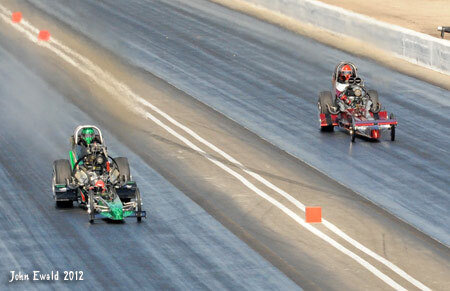 McGee had the lead at the 60' mark and never looked back. 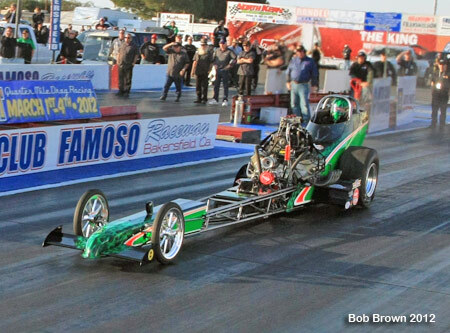 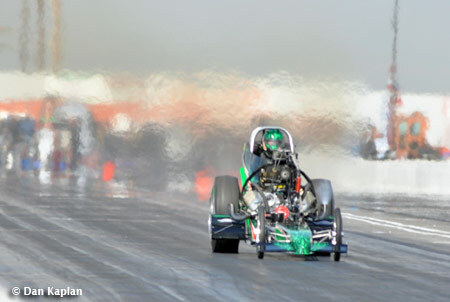 In the lights McGee shocked everyone with a 5.653 (low ET of the round) at 244.78 and he clicked it at the 1000' mark. 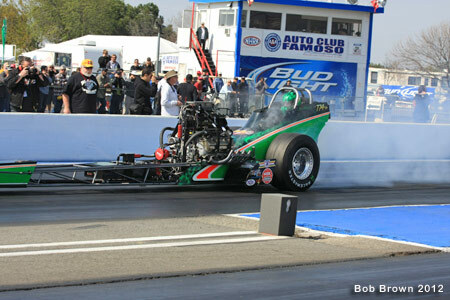 Murphy also shut off early with a 5.801 at 238.89. 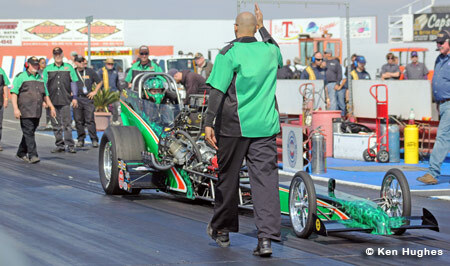 For the third and last qualifying session Murphy was paired with Terry Cox. 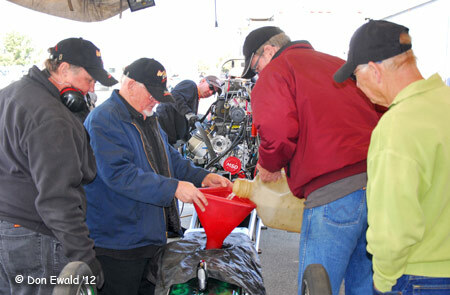 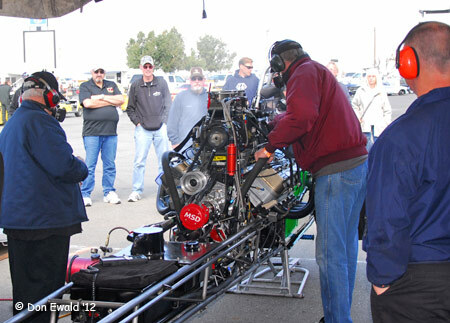 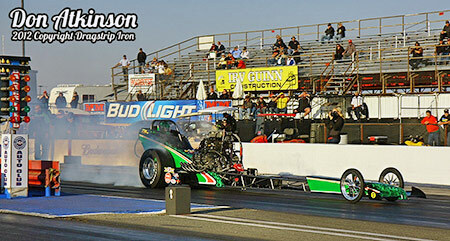 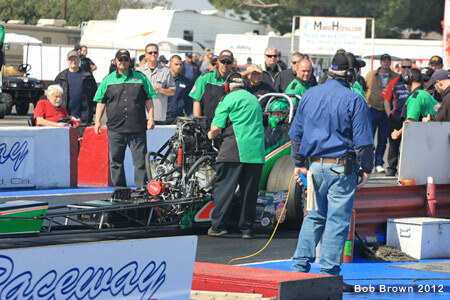 Murphy clocked a stout 5.716 at 235.84 while nipping a couple of piston. 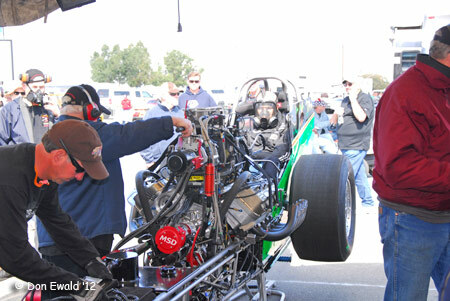 Cox scored a 5.866 at 259.46 which was top speed of the session. 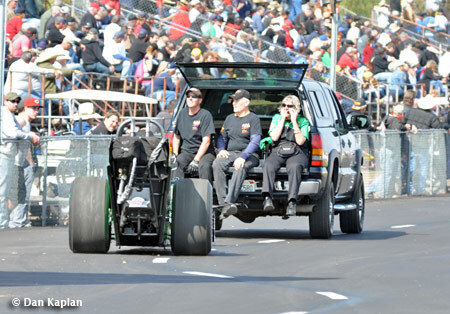 Here's a great look at the new Famoso return road which offers the fuel teams a choice to tow back to the pits in front of the fans. 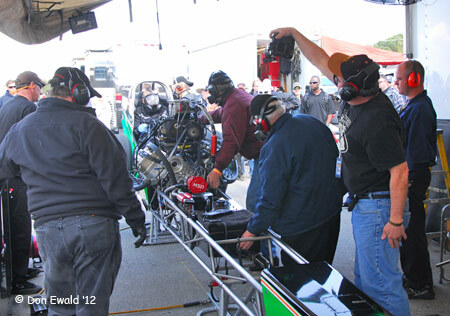 Unfortunately not a majority of the teams took advantage of it. 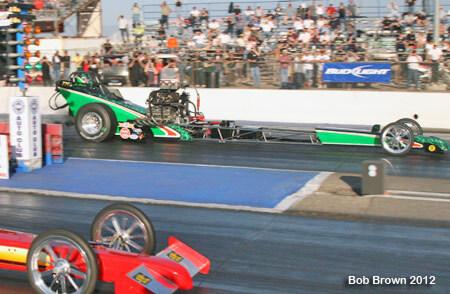 For the first round heavily favored Jim Murphy matched with TF rookie John Rasmussen. 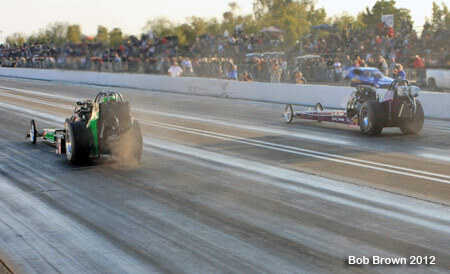 Murphy eased it back into this own lane but the damage was done. 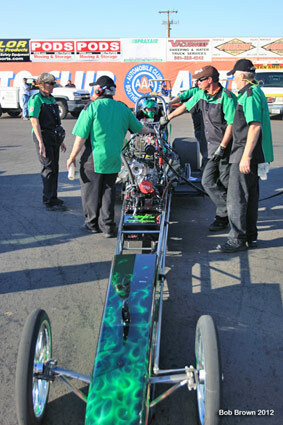 After reviewing some videos of the run and inspection the car after the run, we are mostly sure of this. 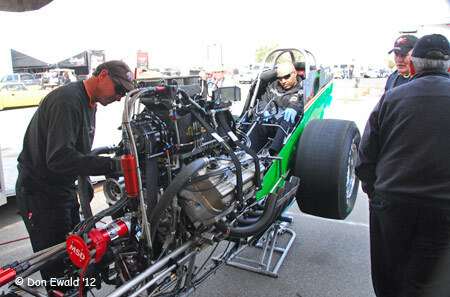 We had selected the right lane prior to the 1st round run via low qualifying ET. 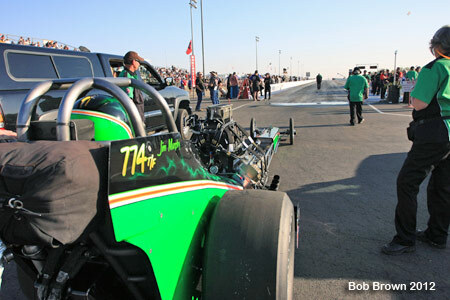 Brendan Murry oiled the right lane severely during the run just before us. 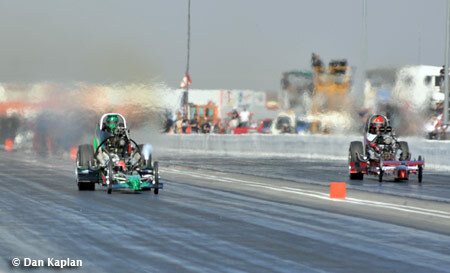 We then changed to the left lane. 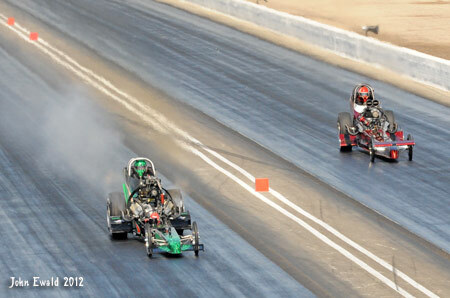 A lot of ash sweep was put down to clean up the mess, so much so that it spilled over into the right side of the left lane. 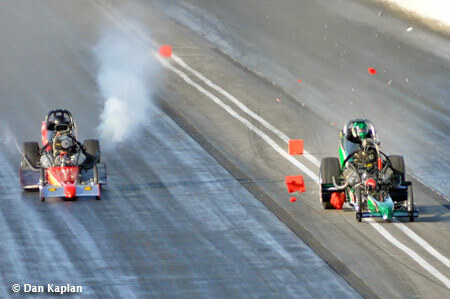 So much that they ran the sweeper on the right side of the left lane, but it didn't get it cleaned very well. 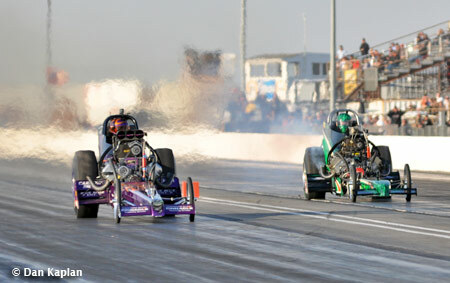 As Jim motored down through to what looked like by the incremental times as an easy win, the car drifted to the right, Jim corrected to the center, the car drifted a little more severely to the right and Jim corrected harder to the center. 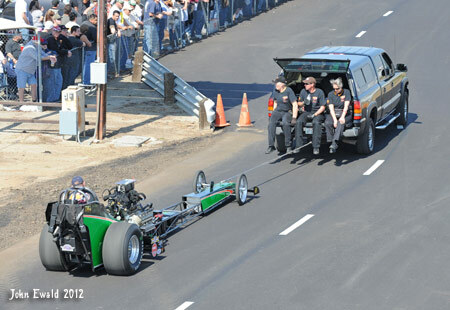 Then the car darted to the right, crossing the line. 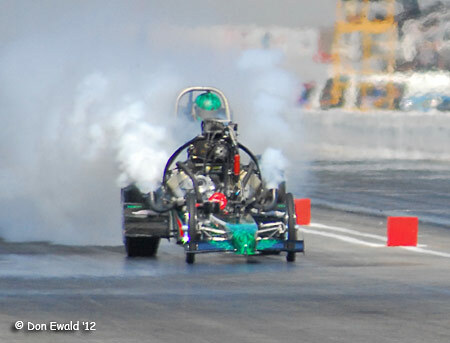 In watching the videos, you can see a cloud of ash sweep boil up each time the car moved to the right. 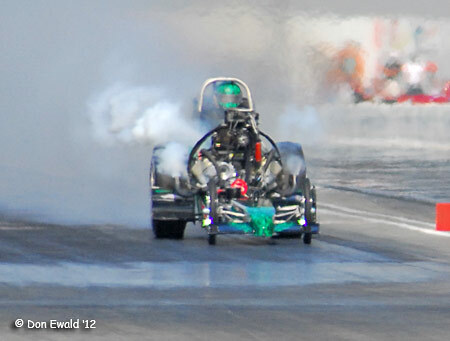 The car had ash sweep residue all over the right side after the run. 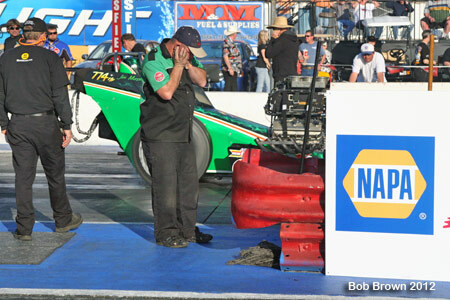 Bummer, that's Drag Racing.